The compact hatch segment of the new vehicle car market is now firmly the leading segment in terms of sales and Opel is no stranger to this segment. But there is a dark side looming to the compact hatch segment which is the price vs. features race. There is a lot of competition from manufactures to try and sell as much features to their customers as they can without pushing up the price of the car... too much. 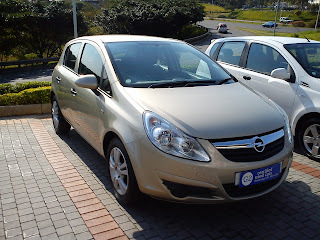 But Opel got it right, sort of, with the Opel Corsa 1.4 Essentia, a.k.a. Chevy Corsa, a.k.a Opel Corsa Enjoy, a.k.a Vauxhall Corsa. 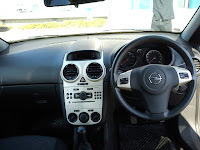 With a market related price tag of R163000-00 (2011-08-19), the car comes full house as far as comfort features go, less rear electric windows. Exterior is colour coded and a set of 15” alloy rims comes standard as well. 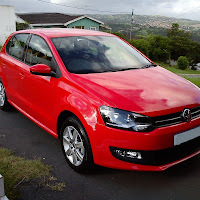 The plus side of this buy is the 3 year/60000km service plan and a 5 year/120000km warranty. Standard service plans are becoming quite common amongst car manufactures but not at the rigth price, I think Opel has managed to fit in their service plan quite well in the R163k price tag. Shantell Naidoo from CMH Umhlanga was kind enough to assist me with the test drive of the Essentia. We did the shorter route to Mount Edgecombe and back to Gateway. The first thing that I liked about the car was the quarter glasses on the front driver and passenger doors. We don’t realise it but there is a big blind spot at the that area on most cars these days, due to the bigger corner posts which accomodates the side rear view mirrors, and I noticed that these quarter glasses helped me a lot when manoeuvring around the parking lot and the parking bay itself. The drive was comfortable but not very impressive on the performance side. For 74kw and 132nm of torque, I would have expected more oomf. But it did a descent 0-100km/h. What I liked about the car was that it was easy to drive, all round visibility was good and I felt confident in the handling and overall drive of the car, I didn’t need to get used to the feel of the car. If you are just a couple, for now, you need not worry about upgrading your car to a bigger car,when you decide to expand the family, as this car comes with impressive boot space, which actually surprised me considering that this is a compact hatch. The lack of a 60/40 split on the rear seats was a big disappointment, as pointed out by Rod, which I totally agree with; it limits the versatility of the vehicles space. Overall I enjoyed driving the car, it has descent features and the service plan is a definite plus. The car is attractive, just like its price. 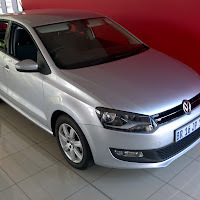 Other options in its category will be the Hyundai i20, VW Polo 1.4, Ford Fiesta. The first thing that I liked about the car was the quarter glasses on the front driver and passenger doors.